Born in Norrköping, Sweden, Johan Dalene began playing the violin aged four and made his debut with a professional symphony orchestra when he was seven. He has been studying with Professor Per Enoksson since 2011. Johan has performed as a soloist in several countries in Europe, China and South Africa. In September 2015 he played at the Prize winner Concert in Musikverein Wien and in Summer 2016 he was invited to be a Student in Residence at the Verbier Festival in Switzerland. Johan looks forward to many engagements as a soloist with orchestras in Autumn 2016, among them the Tchaikovsky Violin Concerto with Norrköping Symphony Orchestra. Johan has participated in master classes with Gerhard Schulz, Alf-Richard Kraggerud, Stephan Barratt-Due, Olivier Charlier, Peter Herresthal, Dora Schwarzberg, Ilya Grubert, Philippe Graffin. He has most recently won the Junior 3rd Prize, Wieniawski Prize, the Chamber Music Award and the EMCY Prize at the Menuhin Competition London 2016. 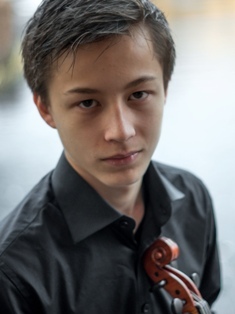 He has also won the 1st Prize in several international competitions including Talents for Europe (Slovakia), Giovani Talenti (Italy), Stockholm International Music Competition (Sweden), Øresunds Solist(Denmark) and the Kocian Violin Competition (Czech Republic). You can watch Johan performing for the Menuhin Competition Junior First Round, Semi-Final, and Final. And you can also watch Johan playing here. If you are interested in working with Johan, please get in touch with the EMCY Office.